What’s the point of rigorous research on complementary/alternative medicine? Homeopathy – Quackery Or A Key To The Future of Medicine? BlackLight Power – do they have something significant? The Environment and Disease: Association or Causation? Digging through boxes in my attic recently, I unearthed my A-level Physics project (c.1982). As it covers some interesting physics and has some pretty pictures, I thought that I’d use some of the material for a blog post. I’ve also unearthed some other old project work, so this will be the first of a short, occaisional, series that I’ll call “Adrian’s attic”. Now, I’m not making any claims that this is particularly good stuff; it’s just something I did. However, it is an interesting bit of physics and I am sure that it could be re-worked into an even better project (for example, I used a pretty poor, wet-film, 35mm camera to take the pictures). 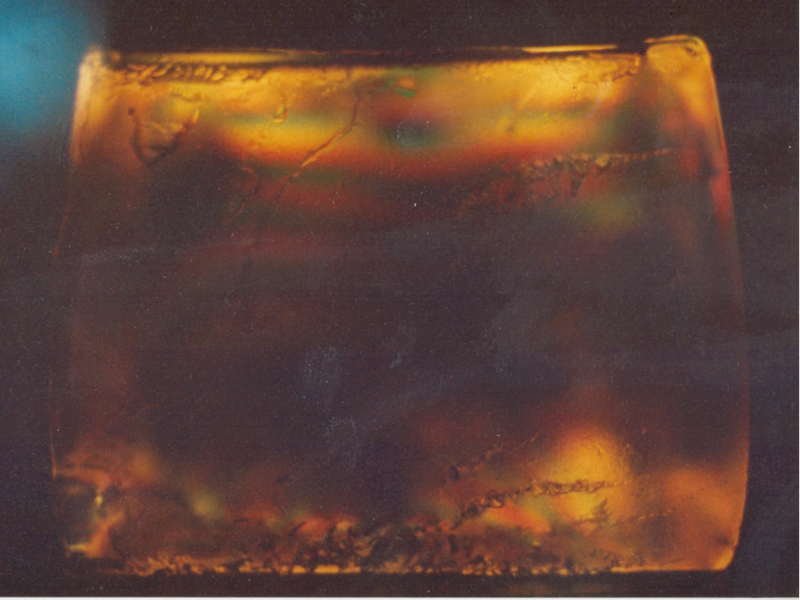 The aim of the work was to devise a gel that was optically sensitive to stress and then examine stress distribution in blocks and beams under different loads. 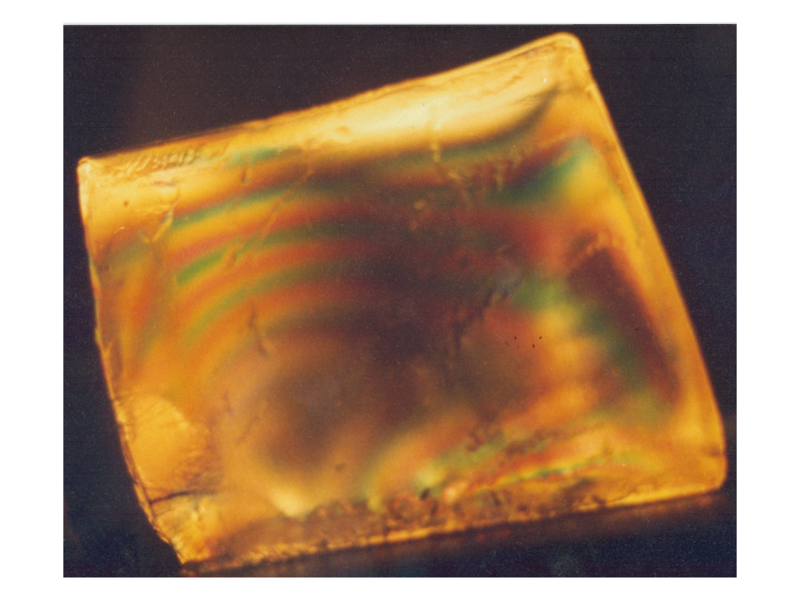 This was achieved by illuminating the gel between crossed polarisers. 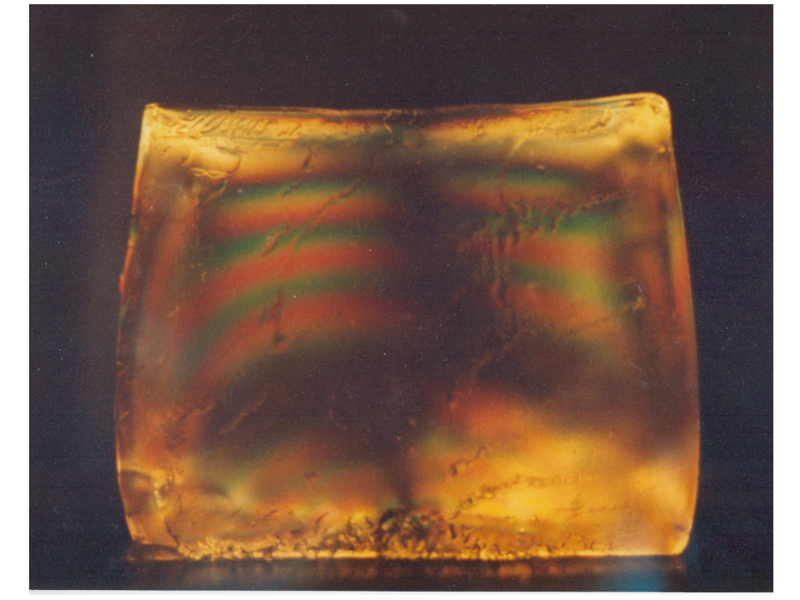 Internal stresses in the gel cause some of the incident light to be refracted; allowing particular wavelengths (colours) to pass the second polariser (analyzer). This generates complex, and beautiful, fringe patterns. These describe the distribution of stress within the sample. The birefringence varies from point to point through a solid; retardance at any point is proportional to the difference between the (orthogonal) principal stresses (σi – σj). The loci of points for which (σi – σj) is constant will, under white light illumination, produce a region of a particular colour (isochromic regions). 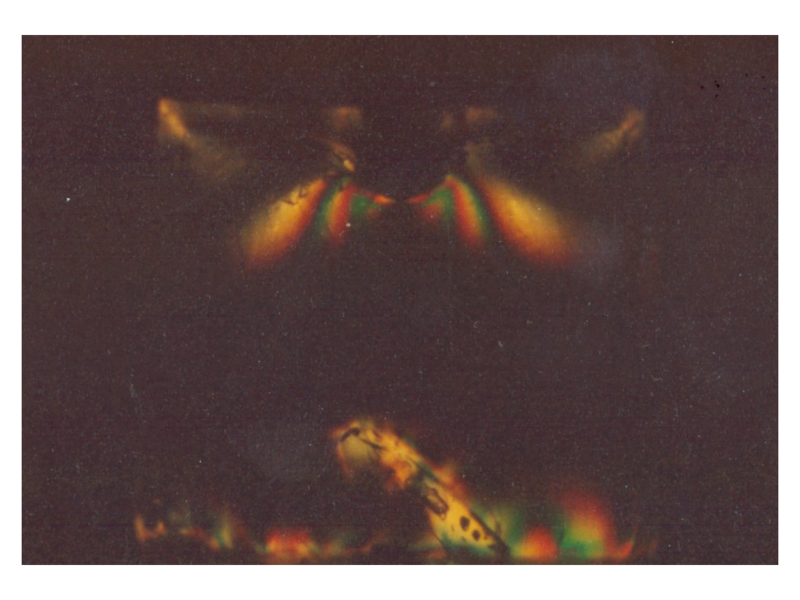 Superimposed on these will be a system of black, isoclinic, bands: the result of light passing though the sample unaltered (the E-field of the incident wave being parallel to the local principal stress axis) and thus being absorbed by the analyzer. These processes cause the complex fringe pattern which reveals the internal stresses. I found the idea that you could “see” the internal stresses in a material fascinating. Hect and Zajac mention that gelatine blocks could be used to demonstrate stress patterns – so I set about determining a suitable recipe. I ended up deciding that gelatine mixed with glycerol and water would give me something with the optical and structural properties I was looking for. I made up various mixes and counted the number of fringes that I could see under a standard load, rated the relative clarity of the sample and tested its load-bearing capacity (to failure). ¹Percentage by volume. ²Mass density in solution. ³Under 10 X 10‑3 kg load. I chose potion ‘B’ for its good birefringence, setting time, relative clarity and reasonable load bearing capacity. Having selected my material, measured its specific rotation (using a polarimeter) I set about capturing stress patterns (I also found household furntiure polish to be an adequate release agent when casting the blocks – though this could be improved upon). Sometimes the casting and de-moulding process didn’t go particularly well. The picture above shows the stress distribution around various production cracks and flaws. Still, it illustrates that cracks in materials tend to concentrate stress. I also didn’t feel too bad about testing this block to destruction! Here (above) is the result of applying a point-poad to the centre of the top face. It’s interesting to see that the centre of the block is still un-stressed; as shown by the large isoclinic region. Distribution of stresses caused by 0.2kg load load placed, on the upper surface, 25mm inboard from the left-hand face. The image (above) shows the results of eccentric loading (inboard of the left-hand face). The stress pattern shows the results of the right-hand side of the block being pulled towards the left. 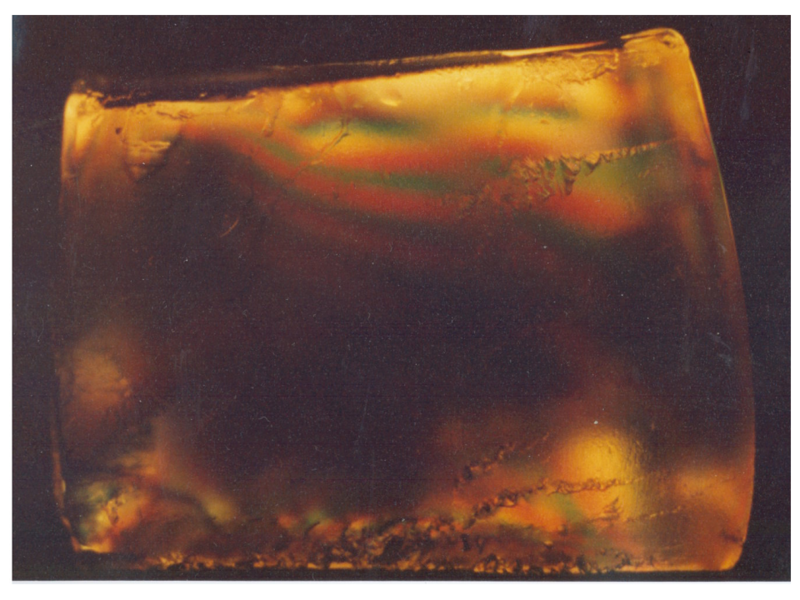 Stress distribution in a gelatine/glycerol block caused by a 0.2kg even load on the top face. This contrasts with the pattern shown for even loading (above). Inclining a block to the horizontal (above) results in a stress pattern caused by the action of gravity. Here stresses act troughout most of the block -even into the centre; in contrast with the other load cases. During the project I was able to run through some interesting load cases – analogues for basic practical structures – and say something about the internal stresses. I even tried to do some quantitative work using a calibration based on an applied load versus number of fringes. With the benefit of 26 years hindsight I think that some of my fringe ‘counting’ was dubious: I saw what I wanted to see and hence got a nice straight-line calibration. This kind of expectation bias is not uncommon in the history of science: we see what we want to see. Blondlot and his infamous N-Rays come to mind. That’s why blinding and automated measurement systems are such an important part of scientific practise. That’s why I take issue on this blog with people pushing non-blinded (and not well blinded) trials as good evidence. This entry was posted on August 3, 2008 at 12:48	and is filed under Adrian's attic. 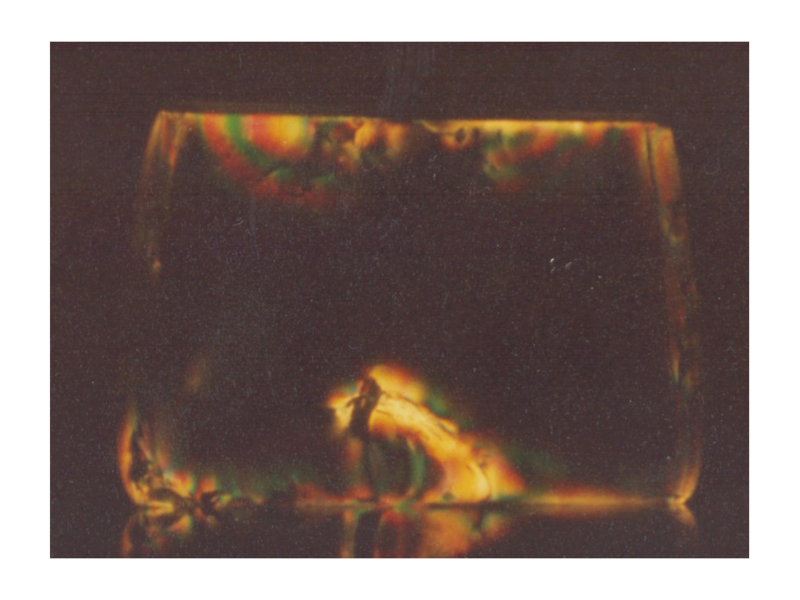 Tagged: A-level physics project, Adrian's attic, photoelasticity, stress birefringence. You can follow any responses to this entry through the RSS 2.0 feed. Both comments and pings are currently closed. I showed this to a relative who must have been a contemporary of yours albeit he took the Nuffield Board (which examining body were you with?). Anyway, he is impressed – if this were the USA, and you had access to firearms, you might have been a very early CSI, shooting into your gelatine mix. I should thank you for sparking some vastly entertaining Sunday lunch conversation as umpteen relatives dredged up memories of formal and informal experiments that they ran as children. Just for continental readers: A-levels are the british equivalent of a high-school degree, that is, the degree you need to qualify for university education? In any case, it’s nice stuff. I never had the opportunity to do anything that “cool” in my physics classes… kind of shows how science should be taught, but generally isn’t. dvnutrix: Thanks. I did Nuffield physics as well. pleick: Yes, the British A-level is the (ahem ‘gold’ ) standard pre-university qualification – usually taken at 18; though these days there are an increasing number of other routes. I think it was one of the strengths of the course I did that there was a project as well as a practical exam. We also did a preliminary project to get us into the approach. I think I’ll do something on one of the elements of our practical exam at some point. Nice post. I liked the ‘moral of the story’ bit at the end of your post so much I just spent the afternoon reading up on the N Rays story [shame Wood’s Nature paper is behind a paywall] and checking out more of Langmuir’s talk. Interesting stuff. Cheers! jdc325: Thanks. Langmuir’s talk is very good.